Exhibition catalog for the Circle of Truth traveling art exhibition. Curated by Laura Hipke & Shane Guffogg Foreword by: Randy Hipke Preface by: Paul Ruscha The Circle of Truth project is a visual game of Telephone, sometimes called a Rumor Game. 49 artists, including Ed Ruscha, Shane Guffogg, Billy Al Bengston, Lita Albuquerque, Jim Morphesis, Charles Arnoldi, Robert Williams, and Ruth Weisberg, created works especially for the Circle of Truth exhibition, in absolute secrecy over a period of nine years. 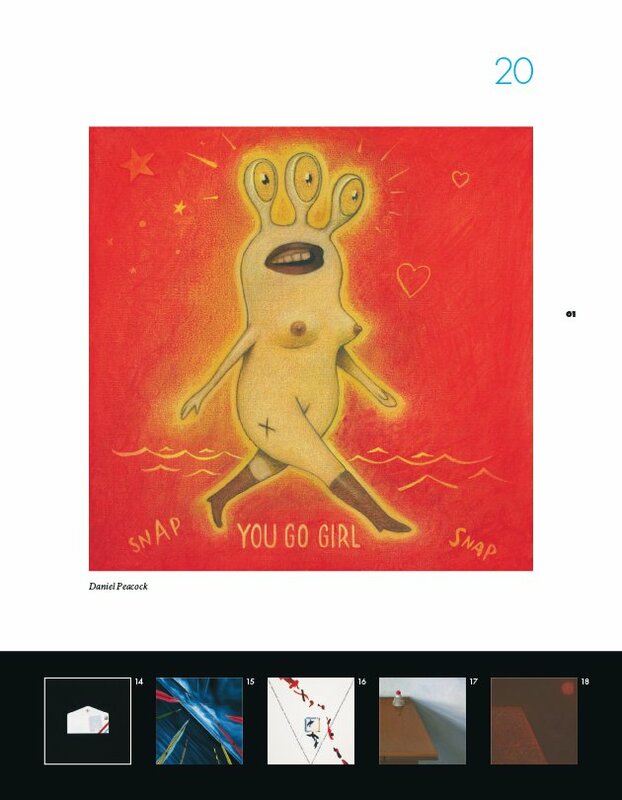 The catalog dedicates a full spread to each of the 49 artists with color images of the art they received and responded to, the art they created, as well as an essay they wrote about their experience. The catalog provides a rare look at the thought processes and studio practices of these unique and private people. The Circle of Truth exhibition is a wholly unique collaboration of 49 contemporary artists, each sequestered and unknown to one another, working in absolute secrecy. Taking a full nine years from launch to fruition, the Circle is a modern, visual take on a common childhood schoolroom exercise, wherein a secret message was whispered from student to student. Often referred to as the Rumor Game or Telephone. In the case of the Circle of Truth, the "whispered" message was imbued in the first painting, which was then delivered, along with a blank canvas, to the second artist. That artist was given no direction other than to find the Truth in in the previous painting, respond to what they perceived, and create a work using the blank canvas, that would go to the next artist, also unknown to them. And so, it went, through 49 artists, each confronted with a work from an unknown artist and a blank canvas. Participants were encouraged to work outside of their normal, comfortable styles. Once their creations were complete, each was asked to write an essay about their experience. Exhibition catalog for the Circle of Truth traveling art exhibition. Curated by Laura Hipke & Shane Guffogg Foreword by: Randy Hipke Preface by: Paul Ruscha The Circle of Truth project is a visual game of Telephone, sometimes called a Rumor Game. 49 artists, including Ed Ruscha, Shane Guffogg, Billy Al Bengston, Lita Albuquerque, Jim Morphesis, Charles Arnoldi, Robert Williams, and Ruth Weisberg, created works especially for the Circle of Truth project, in absolute secrecy over a period of nine years. 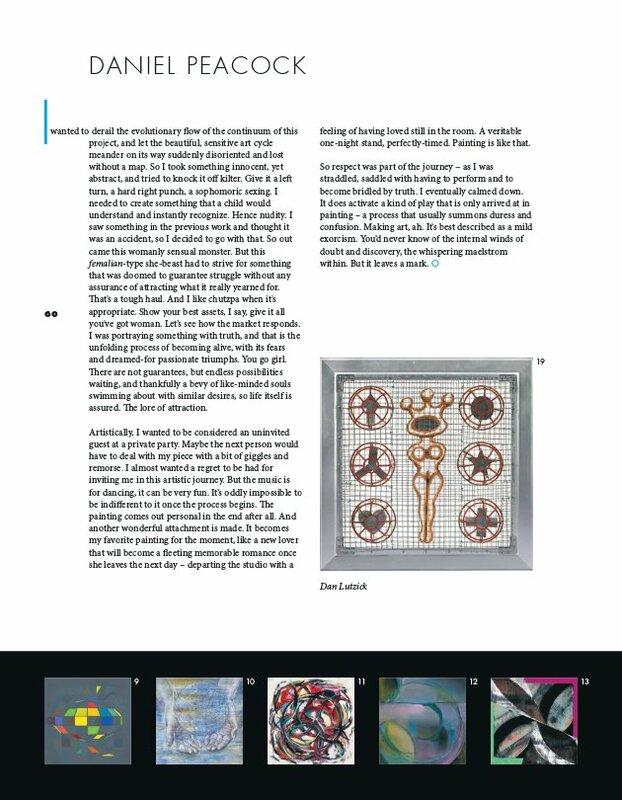 The catalog dedicates a full spread to each of the 49 artists with color images of the art they received and responded to, the art they created, as well as an essay they wrote about their experience. The catalog provides a rare look at the thought processes and studio practices of these unique and private people. The Circle of Truth exhibition is a wholly unique collaboration of 49 contemporary artists, each sequestered and unknown to one another, working in absolute secrecy. Taking a full nine years from launch to fruition, the Circle is a modern, visual take on a common childhood schoolroom exercise, wherein a secret message was whispered from student to student. Often referred to as the Rumor Game or Telephone. In the case of the Circle of Truth, the "whispered" message was imbued in the first painting, which was then delivered, along with a blank canvas, to the second artist. That artist was given no direction other than to find the Truth in in the previous painting, respond to what they perceived, and create a work using the blank canvas, that would go to the next artist, also unknown to them. And so, it went, through 49 artists, each confronted with a work from an unknown artist and a blank canvas. Participants were encouraged to work outside of their normal, comfortable styles. Once their creations were complete, each was asked to write an essay about their experience. The 49 works of art were created specifically for the Circle of Truth by 49 different and often disparate artists. Mostly oil paintings, all of the works measure 20 inches square by 2 inches deep, and are presented in chronological order. The Circle of Truth exhibition opens a dialog regarding the nature of what we consider Truth to be, and even whether we think it exists. The Circle of Truth exhibition touches on a need that resinates deeply in the human psyche – access to meaningful, truthful contact with others. This truthful contact is the secret ingredient in the exhibition. Using paint and words the artists speak to the viewers candidly, providing a rare perspective into their experience and thought processes. Viewers of all ages and backgrounds, will be able to quickly understand and appreciate the meaning of the Circle of Truth. There are no prerequisites or any fundamental knowledge needed to appreciate and recognize Truth. The Circle relies simply on the viewers' inherent human nature. The LA-based Project was conceived by artist, Laura Hipke and co-curated with artist, Shane Guffogg. Exhibiting artists from Los Angeles, Arizona and New York include: Kim Abeles, Lisa Adams, Lita Albuquerque, Charles Arnoldi, Lisa Bartleson, Billy Al Bengston, Justin Bower, Virginia Broersma, Randall Cabe, Rhea Carmi, Greg Colson, Jeff Colson, Stanley Dorfman, Cheryl Ekstrom, Jimi Gleason, Rives Granade, Ron Griffin, Alex Gross, Shane Guffogg, Lynn Hanson, Doro Hofmann, Tim Isham, Kim Kimbro, Bari Kumar, Cal Lane, Margaret Lazzari, Mark Licari, Dan Lutzick, Deborah Martin, Susan McDonnell, Christopher Monger, Jim Morphesis, Andy Moses, Juan Carlos Munoz Hernandez, Gary Panter, Daniel Peacock, Bruce Richards, Michael Andrew Rosenfeld, Ed Ruscha, Eddie Ruscha, Paul Ruscha, John Scane, Vonn Sumner, Matthew Thomas, Alison Van Pelt, Michelle Weinstein, Ruth Weisberg, Robert Williams and Todd Williamson. Co-curators/authors, Laura Hipke & Shane Guffogg, are fine artists whose work resides in both public and private collections. Hipke is a self-taught painter and printmaker. She explores themes of the heart and humanity. Guffogg is a graduate of California Institute of the Arts, and enjoys an international reputation as a painter, sculptor and public speaker.